I'm not saying this hasn't been done before, but I've never heard of it and am a brand new curly, so it's new to me. I thought I'd share in case it might help anyone out When I thought of it in bed at 2AM last, I couldn't wait to try it. This is a drying method, but I will do a step by step of the whole process leading up. Today was 3rd day hair with a lot of product in it, it was getting gross. So i cowashed with some VO5, then conditioned with a nicer cone free conditioner. Finger combed to get out some small tangles. Rinsed with warm water, flipped hair upside down and did a cold rinse. Without ringing hair out at all, I gooped in some Shea moisture smoothie and worked it through, skipped the roots. Then used their milk on my roots. My hair is still upside down and sopping wet at this point. Then I did the rake and shake with hardly any shake I find that If take a pencil sized pieced of hair and rake through it, it tangles it even more, but if I do a couple more finger rakes through it, it will magically smooth out and fall into perfectly smooth curl. Hard to explain, but if anyone wants to see a video, I can figure out a way to show you. After separating out my whole head, I did an all over spray, THEN finally I did one gentle scrunch with a shirt to get the excess moisture. 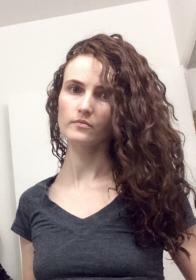 I only do one scrunch at the very end because scrunching even with a shirt makes the frizz so much worse. Sometimes I don't even scrunch at all. Ok , :compress: here's the exciting part!!! I plopped my hair down into a satin sleeping cap ($1 Walmart) and delicately tucked all the rest of the pieces in the cap. No ponytail or anything, it all just piled loosely on my head in the cap, THEN I put on one of those silly soft dryer bonnets that you hook to your blow drier. I got mine at Sally's for like $13 I think- they are on groupon right now too. And Walmart for 10.